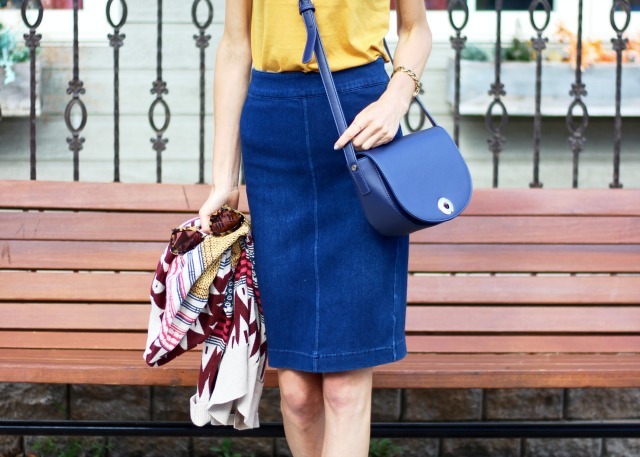 Navy and mustard is a colour combination I did not think I could gravitate to... like ever. Navy on it's own, yes. Mustard on it's own, never. And the two together... well the thought never even crossed my mind! Leave it to Le Château to get my out of my comfort zone on this one. I popped into the store to check out their Fall collection and ended up leaving with a new found appreciation for this Fall colour pairing. I mean, clearly-- the top, skirt, bag and shoes are all from there! Sometimes it takes one piece to spark a whole outfit. When I saw the navy cross-body bag I knew it was coming home with me. It's different than anything I own, and the colour is striking. So often I gravitate towards black bags but knew I wanted something different to pair with the resurgence of denim for fall. I was so excited to get home and find the outfit complemented this fall cardigan perfectly! How 70's, right? The mustard, the kitten heels, the denim pencil skirt... kinda feel like I walked off the set of The Birds (by Alfred Hitchcock, not the furry animal cartoon!). Or That 70's Show! Just call me Donna. Are there any colour pairings you are excited to try out this fall? What do you think of my mustard/navy combo!? Thank you to Le Château for sponsoring this post. Great color combo! Love that chic denim pencil skirt too. This is such a great colour combination! Le Chateau has upped their game BIG TIME! Love the pop of yellow your top adds to the outfit!